Sophos is a provider of antivirus tools that scans for security risks, removes viruses, and protects networks. Sophos’ suite of products include Sophos Home for PCs and Macs, which uses the same antivirus, malware protection, and web filtering technology trusted by businesses worldwide. Sophos XG Firewall Home Edition provides full protection for home networks by covering anti-malware, web security and URL filtering, application control, IPS, traffic shaping, VPN, reporting and monitoring. The provider has Mobile Security solutions for both Android and iOS devices to ensure protection without compromising performance or battery life. HitmanPro – Malware Removal Tool scans Windows-powered computers for any issues and offers immediate resolution. Sophos Antivirus for Linux Free Edition protects mission-critical Linux servers and catches all threats — even those intended for Windows. Sophos’ Virus Removal Tool is a convenient way to track and eliminate any threats lurking on a computer. A software version of the Sophos UTM Firewall delivers full network, web, mail and web application security plus VPN capabilities for up to 50 IP addresses. 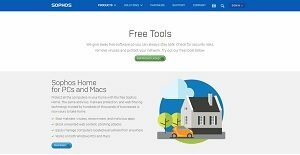 Sophos Home for Windows PCs and Macs helps users manage home computers by protecting them from malware, viruses, ransomware, and malicious apps. The module can also block unwanted web content and phishing attacks. Sophos Mobile Security for Android detects malware and blocks potentially unwanted apps and online threats. A Secure QR Code Scanner blocks malicious content that may be hiding in QR codes. Users are also protected against device loss and theft with features such as remote lock, while an Authenticator manages one-time passwords for multi-factor authentication. Devices are made more secure with Privacy and Security Advisors. HitmanPro – Malware Removal Tool allows users to run scans anytime to completely prevent infection. The module eliminates viruses, Trojans, rootkits, spyware, and other malware. To make scans more thorough, a free second opinion scanner identifies issues that may have been overlooked during the initial scan. Sophos XG Firewall Home Edition delivers full protection for home networks. It has tools for anti-malware, web security and URL filtering, application control, IPS, traffic shaping, VPN, reporting and monitoring. A Virus Removal Tool easily catches and removes viruses, Conflicker, rootkits, fake antiviruses, and threats lurking around a computer. The module can also work alongside other antivirus software. The software version of the Sophos UTM Firewall features full network, web, mail and web application security. It provides VPN functionalities for as much as 50 IP addresses. The solution carries its own operating system and overwrites all data on the computer upon installation. Sophos Antivirus for Linux Free Edition protects mission-critical Linux servers and prevents all threats — even ones that are intended for Windows. The antivirus module is kept light and easy to keep Linux servers running at top speed. It works seamlessly on the background with options to scan on-access, on-demand or on schedule. The module can be upgraded for support and centralized management. Enterprises have diverse needs and requirements and no software platform can be just right in such a scenario. It is pointless to try to find a perfect off-the-shelf software app that meets all your business requirements. The smart thing to do would be to modify the system for your unique wants, employee skill levels, finances, and other aspects. For these reasons, do not hurry and subscribe to well-publicized popular solutions. Though these may be widely used, they may not be the best fit for your particular wants. Do your groundwork, check out each short-listed system in detail, read a few Sophos reviews, contact the vendor for explanations, and finally select the application that offers what you want. How Much Does Sophos Cost? We realize that when you make a decision to buy IT Security Software it’s important not only to see how experts evaluate it in their reviews, but also to find out if the real people and companies that buy it are actually satisfied with the product. That’s why we’ve created our behavior-based Customer Satisfaction Algorithm™ that gathers customer reviews, comments and Sophos reviews across a wide range of social media sites. The data is then presented in an easy to digest form showing how many people had positive and negative experience with Sophos. With that information at hand you should be equipped to make an informed buying decision that you won’t regret. What are Sophos pricing details? What integrations are available for Sophos? If you need more information about Sophos or you simply have a question let us know what you need and we’ll forward your request directly to the vendor.